Thermodynamic Type Steam Trap is suitable for steam piping and steam equipment. It can prevent the leakage of steam and drain condensation water, which thus can save energy and prevent water hammer situation and the trouble caused by it. Thermodynamics Steam trap works by moving valve block ups and downs. 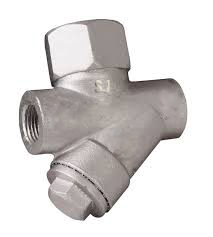 When the valve block is jacked up, the condensation water will be drained out. And when the steam gets into it, the valve block will close tightly.